Sophomore Steve Ziegler on preparation for the next NCAA title! Editor's Note - this blog by Steve Ziegler was written prior to the Isleworth tournament in Florida. I arrived at Stanford on September 8th with the kind of excitement a kid would have if he was reuniting with all his friends at Disney World. I remember how giddy I felt but I also remember the underlying anxiety, the anticipation of competition soon to come much like the jitters you get on the first tee of a significant golf round. I was eager to get started with everything-qualifying rounds, workouts, classes-again because I remember my experience here last year as overwhelmingly enjoyable. There’s an elevated pride that coincides with carrying a Stanford bag due to the great success the program had not just in 2007, but ever since 1942 when Sandy Tatum and company won the 1942 NCAA Title. In a way, those who have preceded us at Stanford Golf make our effort much more worth it, because we are validating their success. Stanford has an exceptional golfing history as many well know, and this has paved the way for championship aspirations again this fall. Focusing on the National Championship from the moment you arrive is something our entire team has come to embrace. However, the road to the championship begins long before May. We made our debut in mid-September at Olympia Fields in Chicago. The tournament was a real treat with a strong field and a very difficult course. Unfortunately, we made too many mistakes to come out on top, finishing fourth behind the likes of Illinois, Indiana, and Oklahoma State. Our next tournament was held a couple weeks later in Palm Springs at the Norman Course of famed PGA West. We had four members of the team finish in the top-15, but unfortunately once again were unable to come out with a win, finishing third behind impressive showings from TCU and UC Davis. We’re currently preparing for our next tournament to be held Oct. 26-28th at Isleworth C.C. in Orlando, Florida. Talking with the guys, I get a heightened sense of excitement despite the prior sub-mediocre finishes, because we’re just waiting for our “impressive finish.” It’s like Coach Ray told the guys the other day, “I’m just waiting for you guys to put on a show.” This is so true, and we’ve seen a show of great golf in qualifying rounds and practice all year. We’re just waiting to display it nationally. 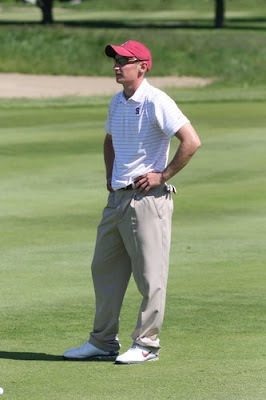 Only a handful of golf programs in the country can say, “With enough discipline, focus, and a little luck, we have a legitimate shot at winning NCAA’s come May.” What’s exciting about Stanford golf, at least since I’ve been here, is we are one of those programs year in and year out. We have the right people in place to prolong this success so when all of us are long gone, Stanford will still be challenging the nation’s best for national titles. It’s amazing how quickly the days pass in retrospect; it feels like I arrived yesterday. I believe this is a testament to how busy we are, but more importantly see it as an indicator of how much fun this team has. We’re chasing championship dreams together, and we’re having a blast doing it. This is a rarity, but luckily our team is certainly capable.